Hadiqa Kiani Fabric World is going to be one of the well known brand of Pakistan. Hadiqa Kiani not only a professional singer as she is also beautiful model as well as attach with fashion clothing. Well, Hadiqa Kiani Fabric World has just recently launched Latest Summer Collection 2014 Volume 2 for women. There kawn products are appreciated in every season due to high quality and innovative designs. In this new addition of Spring/Summer Lawn Collection, Hadiqa Kiani has introduced so many cool and fabulous lawn prints. 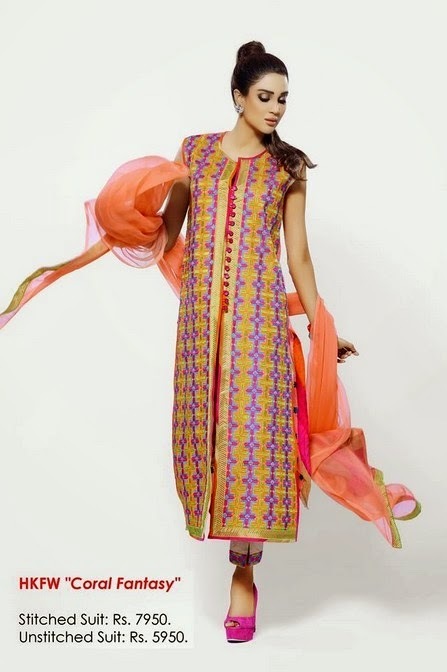 This brand has presents in this HKFW-2014 Vol-2 trendy and casual wear lawn attires. This collection included Black Feast, Chunri Chunari, Rang Mela, Pink Class, Rangoli, Coral Fantasy, and much more other tremendous designs. Hadiqa Kiani has always comes with new ideas and techniques in every season. This HKFW Collection is consists on bright and light colours such as pink, peach, green, black, purple, blue and orange. Girls! 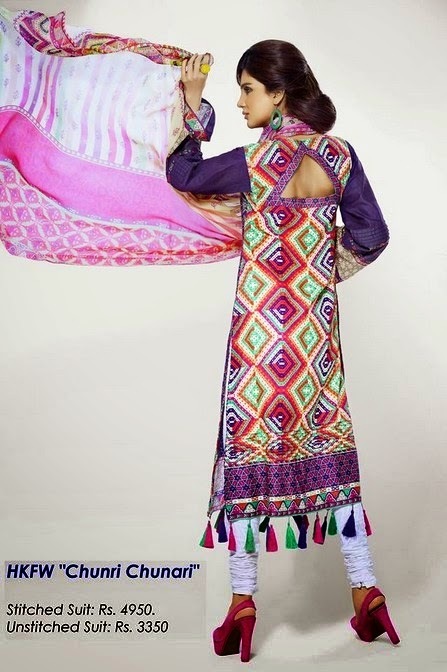 let's have a closer look at Hadiqa Kiani Summer Collection 2014 Volume 2 Catalogue.